August 23, 2013… The Stratford Festival is extending Artistic Director Antoni Cimolino’s production of Mary Stuart for an unprecedented fourth time. The production, described as “electrifyingly entertaining and intellectually exciting” by the Toronto Star’s Richard Ouzounian and “edge-of-your-seat suspenseful” by The Globe and Mail’s J. Kelly Nestruck, features Seana McKenna as Elizabeth I and Lucy Peacock as Mary Stuart, with Ben Carlson as Lord Burleigh, Brian Dennehy as the Earl of Shrewsbury and Geraint Wyn Davies as the Earl of Leicester. “Mary Stuart is striking for the clarity of its storytelling, the constant intensity of its dramatic stakes and, especially, for the evenhanded excellence of Lucy Peacock and Seana McKenna in the leading roles,” says Chris Jones in the Chicago Tribune. “This is one for the memory books, with two remarkable actresses at the peak of their powers,” says Postmedia’s Jamie Portman. With the run entirely sold out despite three previous extensions, the Festival is delighted to offer eager theatre-goers four more opportunities to see the smash hit of the season. Wednesday, October 16, at 2 p.m.
Thursday, October 17, at 8 p.m.
Friday, October 18, at 8 p.m.
Saturday, October 19, at 8 p.m. The play, by Friedrich Schiller, newly adapted by Peter Oswald, follows a period in the life of Mary Stuart, when the former Queen of Scots has been imprisoned in England because her very existence poses a political and personal risk to her Protestant cousin, Elizabeth I. As Elizabeth hesitates over decreeing her rival’s fate, Mary pleads for a face-to-face meeting, and we see how religion can become a tool in the hands of cynical politicians who are willing to sacrifice lives in the supposed interests of the state. The final performance of The Forum event Dear Mary, Dear Elizabeth will be held on August 31 at 11 a.m. in the Studio Theatre. It features Ms McKenna and Ms Peacock reading the letters of Mary Stuart and Elizabeth I, introduced and contextualized by Dr. Ted McGee. Mary Stuart is co-sponsored by PwC. Production support for Mary Stuart is generously provided by Dr. Dennis & Dorothea Hacker, Dr. M.L. Myers and the late Dr. W.P. Hayman, Alice & Tim Thornton and Diana Tremain. Support for the 2013 season of the Tom Patterson Theatre is generously provided by Richard Rooney and Laura Dinner. 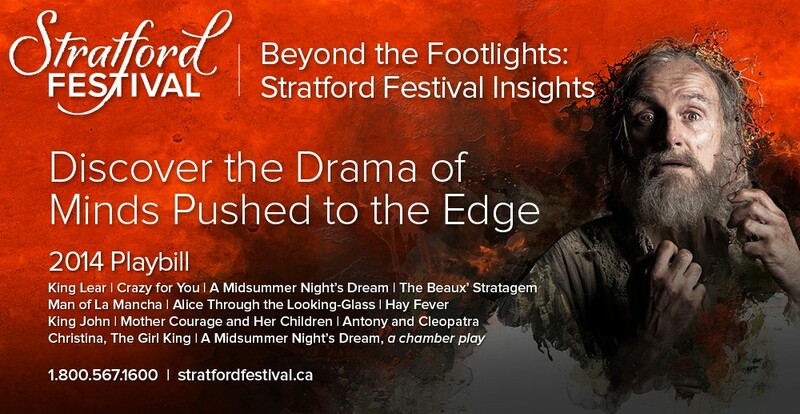 To purchase tickets for Mary Stuart and all of the 2013 season productions, call the box office at 1.800.567.1600 or visit www.stratfordfestival.ca. July 23, 2013… With every performance virtually sold out, the Stratford Festival’s production of Mary Stuart, directed by Artistic Director Antoni Cimolino, is being extended for a third time this season. Already one of the most highly attended productions in the Festival’s history, Mary Stuart will now run for an additional two weeks in October. Wednesday, October 2, at 2 p.m.
Thursday, October 3, at 2 p.m.
Saturday, October 5, at 8 p.m.
Wednesday, October 9, at 2 p.m.
Thursday, October 10, at 8 p.m.
Friday, October 11, at 8 p.m.
“In my 22 years with the Festival, I have never seen a show consistently sell out to this extent,” says Executive Director Anita Gaffney. “Mary Stuart tickets have been in demand since advance ticket sales began. In March we added two performances to the schedule. Then last month we added an additional week of performances for all three productions at the Tom Patterson Theatre – Mary Stuart, Measure for Measure and Waiting for Godot. Now we’re at it again! Mary Stuart features Seana McKenna as Elizabeth I and Lucy Peacock as Mary Stuart, with Ben Carlson as Lord Burleigh, Brian Dennehy as the Earl of Shrewsbury and Geraint Wyn Davies as the Earl of Leicester. It also features James Blendick as Amias Paulet, Patricia Collins as Hanna Kennedy, Peter Hutt as Aubespine, Ian Lake as Mortimer, E.B. Smith as Bellievre and Brian Tree as Melvil, with Nigel Bennett as the Sheriff, Brad Hodder as O’Kelly, Josue Laboucane as the Page, Robert Persichini as the Earl of Kent, Christopher Prentice as Drury and Dylan Trowbridge as William Davison. Production support for Mary Stuart is generously provided by Dr. Dennis & Dorothea Hacker, Dr. M.L. Myers & the late Dr. W.P. Hayman, Alice & Tim Thornton and Diana Tremain. The production co-sponsor is PwC. Support for the 2013 season of the Tom Patterson Theatre is generously provided by Richard Rooney and Laura Dinner. PLEASE NOTE – THIS EVENT IT SOLD OUT AND THE PROMOTION CODE IS INACTIVE. WE’LL BE HOSTING MORE EVENTS THROUGHOUT THE SEASON, PLEASE CHECK BACK FREQUENTLY FOR MORE MEET-UP OPPORTUNITIES. Ben Carlson (left) as Charles and Michelle Giroux as Elvira in Blithe Spirit. Photo by David Hou. 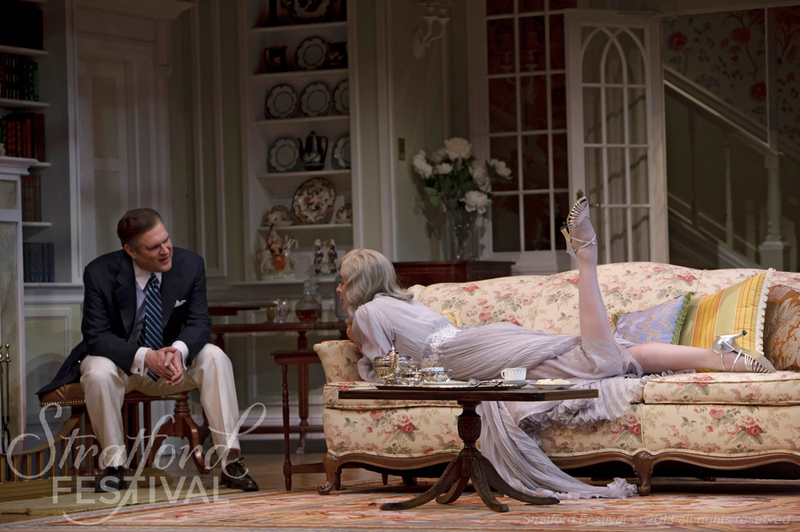 View more photos of Blithe Spirit here! In addition we’ll be holding a draw for a pair of tickets to see any production on our 2013 playbill, along with other Festival swag! You’ll have some time between the meet-up and the performance to visit the Theatre Store and the restrooms, and to grab your seat before the show. This is a great chance to introduce a friend or family member to the Festival and to enjoy a time of fellowship with other social fans. On Facebook? Try ordering the social way with Stratford Social Ticketing! 4) Select your seats and check out! To order your tickets on our website, follow these easy steps! *Ticket price includes admission to the reception at the Chalmers Lounge and the performance. Offer may expire without notice. Not valid in conjunction with any other promotion. Offer not available in A+ seating category. Tickets only available online or through Stratford Social Ticketing on our Facebook page.